Taken on its own merit and it's easy to heap praise on the Yoga 900S. As laptop design goes, it's up there with the best. It's ultra-portable and practical, with ample battery life, silent operation and performance that, while it won't blow anyone away, is sufficient. The sticking point is the price. Lenovo has been pushing its flexible-hinge Yoga series for some time, refining design and capability with each iteration. At the tail-end of 2015 we were impressed by the original Yoga 900, which combined Intel Core i processor power in a slender build to make for a decent, albeit pricey, laptop. With the introduction of the Yoga 900S, Lenovo has taken that design concept and wrapped it into a slimmer carbon fibre build, with slightly smaller 12.5-inch screen and fanless (and less powerful) Intel Core M processor. Perhaps confusingly, though, the 900S is slightly more expensive than its equivalent Yoga 900 brother. Is its considerable £1,099 price tag a step backwards, or is the 900S the hottest do-it-all laptop on the market? The Lenovo Yoga 900S is wonderfully slender and lightweight. It's a gram shy of a kilo and measures just 12.8mm at its thickest point. Thanks to that carbon fibre build it's the lightest laptop we've used for some time - the 350g it sheds compared to our go-to MacBook Air 13-inch might not sound like much, but it's highly apparent in day-to-day use, especially as we're so often out and about. Key to the 900S's design is its 360-degree-capable "watchband hinge" - which means the device can be freely positioned in laptop, tablet, tent or stand positions (or anything in-between) - that looks like a stainless steel watch strap running the length of the join between keyboard and screen. It's fancy looking and made of a jaw-dropping 813 pieces, which is quite the engineering feat. Whereas the original Yoga 900 came in look-at-me champagne gold or orange exterior finishes, the 900S's silver or champagne options are a little more subtle. The silver finish of our review model means the hinge matches the exterior shell's finish, rather than standing out like an eye-catching piece of jewellery. It looks great and feels high quality. The presence of that hinge does beg the obvious question, though: do you really need a flip-around laptop design? Being able to position the 900S into its tablet position has its benefits, but it's not as slim as a standard tablet, while the tent and stand positions are fun but not something we've found ourselves using often. The design also inherits some oddities. The massive lower bezel around the screen just looks, well, odd. And with Lenovo itself making slimmer-bezel devices - not to mention competitors like Dell with its near-edge-to-edge screens - the amount of black edges seems like a hangover of the design template rather than a necessity. It's not exactly unsightly, though. There's a good array of connections from a device so thin, too. Two USB 3.0 ports - one of which doubles-up as the charger - accompany a USB Type-C port for a bit of aded future-proofing, plus the usual 3.5mm headphone jack. The only notable loss compared to the original Yoga 900 is the 900S's lack of an SD card slot. And, ok, there's still no HDMI output either. A Microsoft Surface Pro 4 offers just one full-size USB port, so the Lenovo has the upper hand here. And while we like the potential of Type-C USB, devices such as the 12-inch MacBook that rely on it as the only port have got a little ahead of themselves. Open up and the 900S's internal construction is a little unusual too. The inner keyboard has a leather-like finish that is far nicer to rest wrists on that the typical soft-touch plastic that most laptops offer. The lip rolls off too, in a smooth finish, that ensures no "cutting" sensation on resting wrists. The keyboard arrangement is full-size, with some nifty shortcut keys across the F-keys top row. It's comfortable to type, with the reach and spacing feeling spot on. The keys are rather taut, though, with a limited press that feels a little lighter than what we're used to. That's worth it for a little less sound, though, as the 900S doesn't exhibit the same clickety clack of some keyboards. Like several small laptops, the shift and backspace keys have been filed away and turned into nubs of their former selves (the right-hand one, in particular, is lost among the directional arrows; the left merges with the backslash key to retain full size - but we can't work out how to combine the two to make them function as only one). You'll get used to this style in the end, but we prefer the elongated keys. It's half-way there with the But at least you get a keyboard backlight to ensure typing in dim light is easy. Oh, and the keys' colour matches your colour finish - so silver in this instance, but champagne gold if that's the model you buy. As for the trackpad, we rather like the smooth sunken pad, which is surrounded by a chamfered silver edge. It's got a tactile quality that can cause a bit too much finger friction on occasion, but it's rarely a problem. We've found the responsiveness perfectly fine - which isn't something we found with the earlier Yoga 900 model. In this 12.5-inch form, the 900S takes a slight resolution cut compared to the original 900. But you won't exactly notice: its 2560 x 1440 pixel IPS LCD panel packs in plenty of pixels for a greater-than-HD resolution. It's as much detail as you'll need, with a density that's only a tiny bit behind, say, the MacBook Pro or Microsoft Surface. But there are some issues. The 900S's screen is a touch reflective, which is among its biggest issues. As we mentioned before the epic lower bezel arrangement is also rather odd looking. It's as though this laptop could be smaller yet. We've not found the same over-sharpened appearance from this laptop as with the original 900, though, which is good news (it is a different panel, after all). In addition to the screen being used to look at things, it's also touch-sensitive and very responsive indeed. And with Lenovo's WriteIt software installed you can even scrawl on open pages, taking annotated screen grabs without the need for an additional stylus. An interesting little software feature, especially given the rise in 2-in-1 laptop replacements of late. Although this solution is nothing near to Microsoft's stylus-based solution with the Surface Pro. From the off it's clear the 900S isn't going to be as powerful as the original Yoga 900. That's down to Intel Core M. But the obvious benefit of Core M is that it's silent thanks to no fan, and therefore lower in terms of power consumption. And most users aren't going to notice a big difference. Pitch it against a more powerful system running a game on Steam and it will obviously be lower frame-rate and/or resolution on the Core M device. But that's not the exact target audience of this laptop. And we've been batch processing images via Photoshop quite happily. Again, not as fast as we can on a beefier setup, but that's to be expected. The big issue, really, is that the Yoga 900, packing its Intel Core i7 processor and 8GB RAM, is actually cheaper than the 900S. That doesn't make loads of sense. It's a little bigger and heavier too, but there's an SD card port and the battery life roughly matches despite the more powerful innards. Speaking of which, the Yoga 900S lasts out surprisingly well. We've been testing a variety of 2-in-1 competitor devices lately - from Huawei MateBook and Acer Switch Alpha 12 to Microsoft Surface Pro - and their battery life is always under the 7-hour mark. Not so the 900S, which we've been getting around 7.5-hours of use from per charge, doing all those day-to-day normal tasks. Dim the screen just to watch video playback with airplane mode on and it'll last even longer. At first glance we thought we would prefer the Yoga 900S over its slightly larger and more powerful Yoga 900 brother. On one hand, we do: that sub-1kg weight and 12.5-inch form factor is great. On the other hand, we don't: it's less powerful, yet costs more. 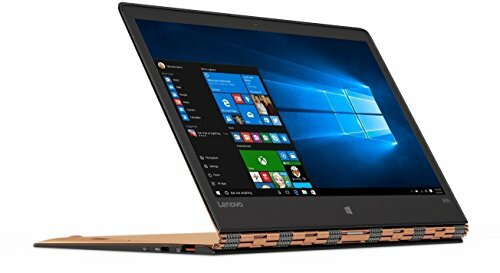 Which would make use lean towards the standard Yoga 900.